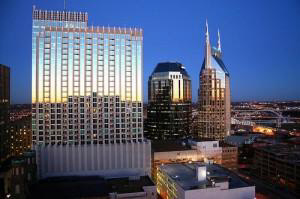 Here you'll find a list with a selection of companies from around the Nashville Tnn, area. The music manager mainly handle negotiating on the band's or singer's behalf with the label, the publisher, merchandise company or any other business company. The reason why a (signed)band need a management company is that the band ,or singer can focus on his career as a songwriter,and performing. When going for a career as an entertainer...then you certainly must take a visit at the center of US music business..Because that's what Nashville is all about..
Music, entertainment and the whole business that's involved..... Nashville is a great adventure for the starting singer songwriter...Many have started their buisness in Nashville, and many will follow.. In the past , Nashville was merely a city of country music.. But, today this is all changed and many other style of music ..
Bluewater Music Nashville .. Operating internationally over 25 years..
Cherry Heart's management Division is a company that developes Nashville musicians and music artists..
management for great country music artists Unicorn Artist Management specializes in providing quality country music ... and consultation services for all Lariat Records and CMG-Nashville artists! Thanks for your visit. Feel free to re-visit our site to follow the updates..